An off-colour Brighton & Hove Albion fell victim to a rampant attacking display from Liverpool on the final day of the Premier League season at Anfield. It was stark contrast for the Seagulls, who secured Premier League safety after promotion with a historic success over Manchester United with two games to spare. Thankfully, that was ahead of games against Manchester City and today's with Liverpool, arguably, the best attacking sides in the league. Despite that, they managed a 15th-place finish in the league, exceeding virtually everyone's expectations at the start of the campaign. The attacking prowess showed in the first half as Liverpool opened their visitors up time and time again and could have easily led more than 2-0 at the break. In truth, Albion were chasing shadows in the bright Anfield sunshine. The result means that Albion end the season with a record 13 Premier League away matches without a win; the last was beating Swansea on November 4. They, and relegated West Brom, also have the unwanted tag of the division's joint-lowest scorers away from home with just 10 goals. But despite all that, and a notably poor performance, they will be playing Premier League football again next season. Chris Hughton's side were facing an opponent that against they had won just four of the 26 all-time meetings, losing 14 and drawing eight. 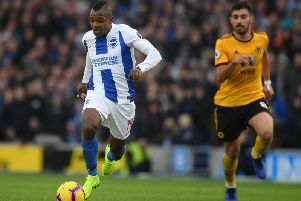 Albion made four changes as Jurgen Locadia, Ezequiel Schelotto, Beram Kayal, Solly March all came into the starting XI for Leonardo Ulloa, Bruno, Pascal Gross and Jose Izquierdo, who was not included in the squad. For the Reds, James Milner was ruled out with injury, but Sadio Mane passed a fitness test. And Jurgen Klopp opted for an attacking line-up as they went in search of sealing fourth, selecting Roberto Firmino, Solanke and Salah joined Mane in a forward four. Liverpool showed their attacking intent within 30 seconds as Mane burst forward and won a corner, Shane Duffy was then called upon to throw himself in the way of Firmino's shot from 20 yards, before Jordan Henderson then fizzed one just wide. Solanke then raced in on Maty Ryan as Duffy horribly chipped a back-pass his goalkeeper and the Reds striker looked favourite to win in, but Albion scrambled the ball away. At the volume crept up, the home side had two penalty appeals for handball waved away, both against Duffy, one outside and one inside the box. That differed from the one on the 20-minute mark when Duffy appeared to miss-time a tackle on Salah and the Egyptian tumbled in the box and the Albion man wiped him out, although replays show that Duffy got the faintest of faint toes on the ball. Seconds later, Mane raced through one on one, but Ryan managed to blocked away the forward's angled shot. The home side had the lead they had been threatening on 26 minutes. Trent Alexander-Arnold brought the ball forward and knocked into Solanke in the box. He flicked it around the corner for Salah, who neatly rolled into the bottom corner. It should have been 2-0 soon after as Sane sprung the offside trap and went through two on one with Ryan. He opted to square to Salah, but Ryan got a hand to it to claw away and Duffy blocked the follow-up on the line. The relentless attacks continued and Mane remained the string puller, but Albion held out until the 40th minute. The second came as a corner was only half cleared and whipped back in by Andy Robertson for Dejan Lovren to rise highest with a bullet header that sailed past the Albion defence. Just seven minutes into the second half it was 3-0 as Liverpool broke quickly and a Salah pass found Solanke, who crashed his first Liverpool goal into the roof of the net. Hughton turned to Glenn Murray and Gross on the bench, replacing Locadia and Kayal, it seemed to give the visitors a better outlet. And, while chances were still at a premium, it did seem to stem the waves of attack. With five minutes to play, Liverpool did make it 4-0. A Danny Ings' cross was cleared by Lewis Dunk only as far as Robertson, who drilled home despite Dunk's best efforts of a diving header on the line. Liverpool: Karius, Alexander-Arnold, van Dijk, Lovren, Robertson, Henderson, Wijnaldum, Mane (Lallana 73), Salah (Woodburn 83), Firmino (Ings 83), Solanke. Unused subs: Mignolet, Clyne, Klavan, Moreno. Albion: Ryan, Schelotto, Duffy (Goldson 71), Dunk, Bong, March, Stephens, Kayal (Gross 57), Propper, Knockaert, Locadia (Murray 57). Unused subs: Krul, Bruno, Suttner, Ulloa.